Proclaimed "one of hip-hop's most promising new acts" by Billboard, Maryland rapper .idk. 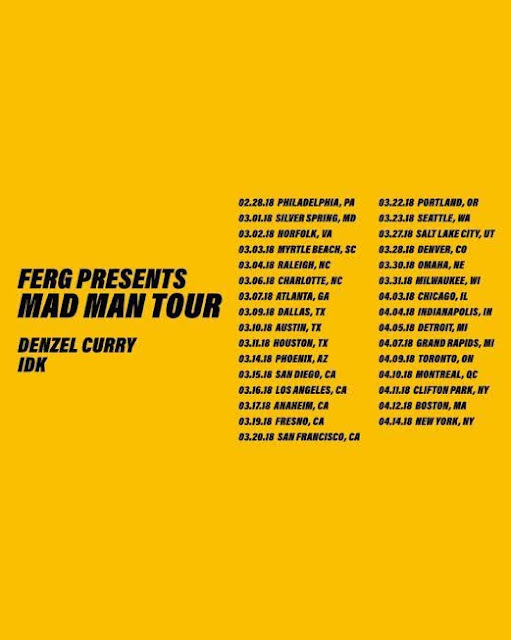 joins A$AP Ferg and Denzel Curry on the massive 31-city North American Mad Man Tour next month! Coming off the release of his critically acclaimed album IWASVERYBAD in partnership with Adult Swim, a sold-out European tour with Joey Bada$$, an explosive performance at the inaugural Rolling Loud SoCal festival in December, and recently being named one of the Best New Artists of 2017 by Pigeons and Planes, you don't want to miss the opportunity to see .idk. live when he comes to your city!